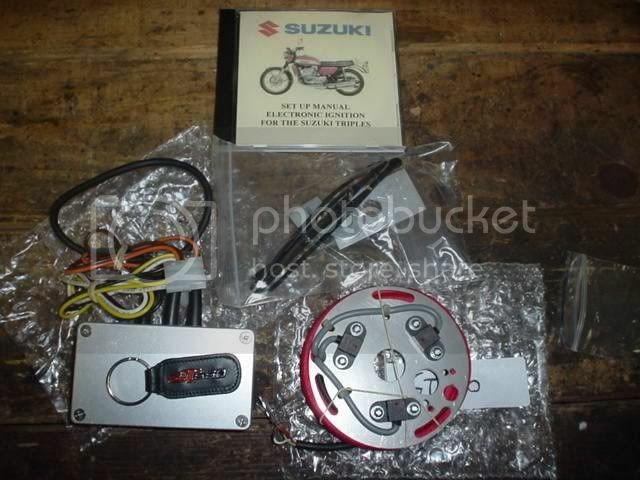 On the parts an more website I found a kit that will eliminate the point ignition system on the gt750. It is $200. Thought I would try it out. Has anyone tried it and if so what would you say about it ? Good or bad setup ? It looks like a Boyer Bransden unit designed IIRC for a Kawasaki triple but works on a GT. I tend to think that anything is better than points but not everyone agrees. There are a few ignition system options for the GTs now. I have made a couple of DYNA systems but I don't think I'd do that again. I have a fully programmable Ignitech system for my next project. Choices.. It looks like a Boyer Bransden unit designed IIRC for a Kawasaki triple but works on a GT. Indeed - that's what it is. Folks here in Calgary have had good luck with them, although they are a bit of a pain to install. I've written a bit about them here, here and here. If you are in Canada, then these folks have offered good pricing in the past. I've just bought a couple of Accent units - I'll let folks know what I think of them after I've got one installed. I'm totally ignorant when it comes to electronic iggys. Seems as though there's a ton of them designed for the GT750. I see on the Accent site that the they cover GT380 and GT750. What about my GT550? Will one of these two work? Do most work with stock coils or require an upgrade there as well? AFAIK they all work with stock coils. 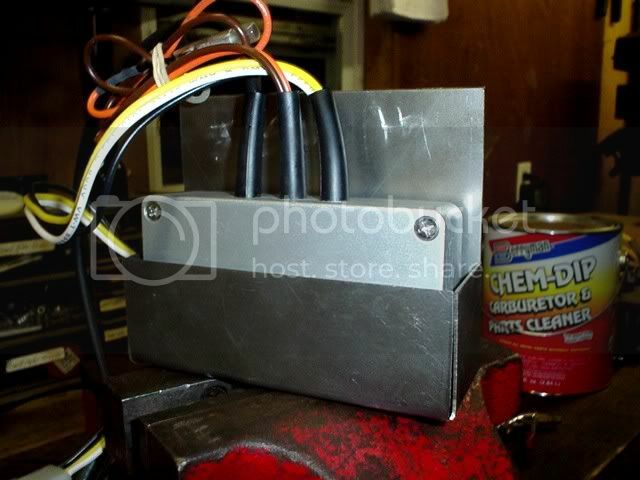 Low impedence coils draw more current and can flatten the battery unless the switching circuits are designed for them. Newtronics, Boyer and Accent, and Marcel's all work with stock coils or replacements with the same resistance. Ignitech can be programmed for either. Also occasionally listed on US eBay. AutoCar acquired the company, and has been updating their products. They used to have one kit for the triples & you had to assemble the parts differently for the GT550. Now have different kits for the GT380/GT750 & GT550. I have one for my GT750 but haven't installed it yet. Per the reviews I've seen, its easy to install. They used to have a kit for the T500. Am inclined to think they will eventually release an updated kit for it. Also have a kit for the T250/T350/GT250 for 1975 & earlier. Have read some older online posts about installation issues, but the kit may have been updated to solve the issues. The base plate for the pickups appears to be plastic in the older kit. I have the updated kit, and the base plate is now metal. Also, the base plate for the older kit has stickers for GT550 installation. They have a kit for the triples but have discontinued kits for the GT250/T500. See oldjapanesebikes's post for comments about them. NewTronic's older kit for the GT380/GT550/GT750 required reassembly when used on the GT550. Since you can't reassemble the Accent kit, I would expect that you can not install it on the GT550. Their kits are more expensive, but they also replace the alternator and coils. Have seen favorable online comments about the kits. Should be a good choice for the T250/T350/GT250/T500 because you'll also upgrade their rather dismal alternators. Will allow you to upgrade to a 55/60W H4 headlight. Not sure about use for GT550/GT750, looks like the stock alternators might have higher output. Currently I'd pick the NewTronic kit for the GT750. 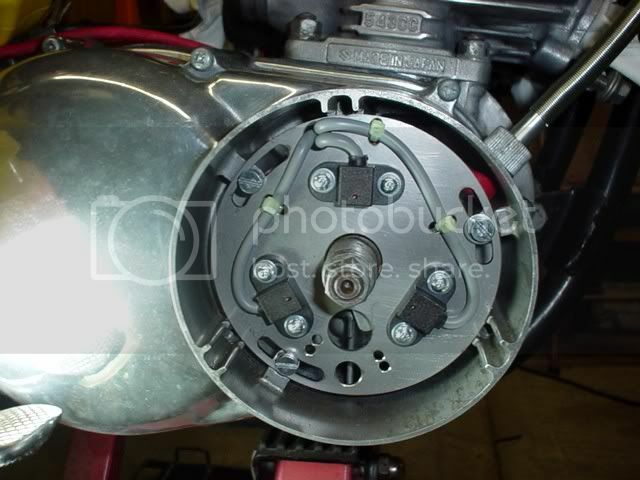 At $250, its a little more expensive but its specific to the GT750 & easier to install. The Accent kit looks interesting and may eventually be the best choice. But for now I don't know anything about it. I see on the Accent site that the they cover GT380 and GT750. What about my GT550? The unit from Accent definitely will not work on the GT550 - you would need to go with one of the others. I've put aftermarket coils on my GT250, T350 & GT750. Coil mounting points on the coil brackets are 80mm apart for the twins & triples. Primary resistance is 4 ohms. Only source for coils I've found with correct dimension & primary resistance is Rex Caunt Racing. Rex sells 2.5 & 4 ohm coils. Make sure you get the correct ones. T250/T350/T500/GT380/GT550/GT750 use 4 ohm coils. GT750 definitely ran better when I switched coils. Also got a nice reduction in vibration. I switched the coils on the GT250/T350 when I got the bikes, so I don't know how much of an improvement I got. The ignition wire is centered over the mounting screw on the Suzuki coils. Its offset on Rex's coils. For the GT380/GT550 you can install the coils with the ignition lead facing forward if you want. Can't do that on the GT750 because of the coolant tank. As a result you will need to flip one of Rex's coils over to mount them on the bike. This is how I installed them on the coil bracket for my GT750. I filed down the corner on the bracket near the right coil to slightly increase the gap between the bracket and ignition wire. Stock coils are mounted with two coils to the right of the GT750 centerline and use two bolts to mount the bracket to the frame. I mounted the coils with two coils to the left of the center line. Used one bolt in the existing hole. Could drill a second mounting hole if you want. Just talked to the people at Rex Caunt. They have about 100 of the 4 ohm coils in stock. Would be a good time to order them. 100 coils might go quickly since its spring and the new riding season is here. I have a 2nd year now on Marcels unit in a 550 and I am very pleased with it. It comes with gt750 instructions but once you switch sides of the bike it goes on without trouble. Pretty much plug and play. The question you have to ask yourself is, Do I feel lucky? Well....do ya punk? I just asked about shipping for the coils to Florida so I'll wait to see whats their reply. They look like the HT lead is screwed into the threaded post and covered by a boot if so thats the best way for changing wires when the time comes? Correct. HT lead screws in & is covered by a boot at both ends. They come with a cap. For my GT750, I used their boots & NGK LB05F caps. Nice looking coils. Thanks for posting that link. I haven't checked Rex Caunt's site for a while and it would not have occurred to me to look there for GT coils. Thank you for the info on the Newtronic ignition kit. I am going to buy that and a new set of coils too. Those coils are nice.